Sunrise construction & Builder Company is a comprehensive web template for all types of construction companies. 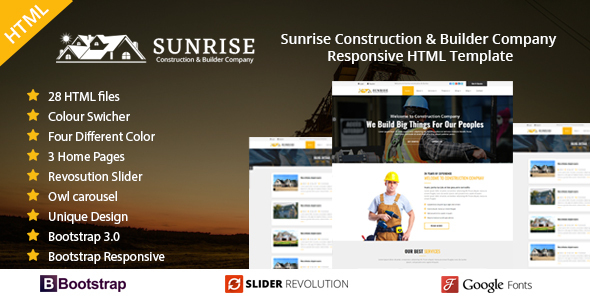 Sunrise construction & Builder Company is a comprehensive HTML template. It is an original business template ideal for construction, building or any other company related to this business. It has been build with the latest web technologies and standards. The layout is drag responsive and looks attractive at all screen sizes whether it is a Desktop, laptop, Tablet, or mobile. Template is bug free and has been tested on all web browsers. It has many features and can be integrated to any development platfrom/framework. It can be customized in a very easy way. Image is not included. Detailed documentation : Included Extensive documentation plus great guides on how to setup and customize, Our documentation will make your customizations super easy and fast! Images used in demo, even they are sample, are not included in downloadable file. All images are replaced with placeholder, This is purely an HTML/CSS template and not a WordPress or any other CMS theme.